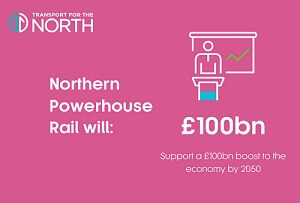 Northern Powerhouse Rail is poised to deliver transformational change to the North boosting the economy and improving connectivity for millions of people. Leaders from the city regions of Hull, Leeds, Liverpool, Manchester, Newcastle and Sheffield have welcomed the move to bring fast and frequent rail services to the region – and new opportunities for businesses and residents. Transport for the North is now preparing outline plans for the whole of Northern Powerhouse Rail, expected to be agreed by partners from the North of England prior submission to Government in December. The major rail system will provide fast, frequent and reliable rail links between the North’s six major city regions improving connectivity across the northern powerhouse through faster journey times and integration with the high-speed rail links across the North. The multi-billion-pound project will see station improvements, new and improved rail lines and integration with HS2. It’s an ambitious programme spanning 30 years, but work could start as soon as 2020 if the Government approves the masterplan. Leeds: More than 2.6 million people and 124,000 extra businesses will be within 90 minutes’ reach of Leeds and the programme will see greater capacity and significantly higher speeds on the network than today. The plan will see upgraded and new routes between Manchester and Leeds including Huddersfield and Bradford. Manchester: The programme will see new and faster connections to Leeds via Bradford as well as vastly improved connections to Sheffield, Liverpool and Manchester Airport. Nearly 70,000 extra businesses and over 1 million more people will be within 90 minutes’ travel time of the city centre. Newcastle: 28,000 extra businesses and nearly half a million more people will be within 90 minutes of Newcastle. The network will operate with greater capacity and speed and could include an upgrade to the link to Leeds as well as a connection to the HS2 junction to travel south to the Midlands and London. Sheffield: Over 100,000 more businesses and nearly 2.4 million more people will be within 90 minutes’ reach of the city. Options could include upgraded routes to Manchester, Leeds and Hull as well as a connection to HS2. Northern Powerhouse Rail will sit at the heart of an integrated Rail network which will link in with the West and East Coast main lines and HS2, providing wider connectivity to Scotland, Wales and the rest of England. 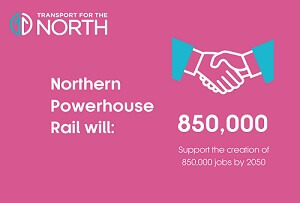 Research commissioned by Transport for the North has demonstrated the power of Northern Powerhouse Rail to connect people, jobs and businesses. “Northern Powerhouse Rail is a bold and ambitious plan that will deliver transformational rail improvement at a scale witnessed only once in a lifetime. For the north to thrive and grow we need better and more seamless rail connections across the North and to the rest of the UK. Northern Powerhouse Rail is intended to help rebalance the economy, giving millions the chance of business and career opportunities that the existing rail infrastructure cannot deliver. It will feature new and major improvements to existing rail lines, as well existing routes, supporting the creation of more than 850,000 jobs in the North of England by 2050 and an extra £100 billion into the economy. Manchester, Hull, Leeds, Liverpool, Newcastle and Sheffield will all be key hub stations on the Northern Powerhouse Rail network with Manchester Airport also a vital component, offering global connections. Working with the Department for Transport, Transport for the North intends to submit the Strategic Outline Business Case to the Secretary of State in December. Subject to further design and business case approval, construction could then begin in 2024.